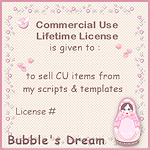 This is a one time purchase for a lifetime license to create CU items from my scripts and templates for resale. 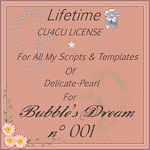 Once you purchase the license you will get a zip to download, that contains a text file you have to fill in and email to me. I will then email you the License with your license number and an image you have to post on your blog, web site or store front. 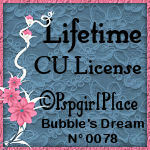 This license is for my CU scripts and templates only. Please note this is for the license only! 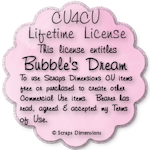 You must purchase my CU products separately. as long as you ADD something to them. - You cannot just run my scripts or actions and then resell as is. as long as you add something of your own creation to it. - It may NOT be made up of more than 40% of my products. as long as you follow all these guidelines as well. 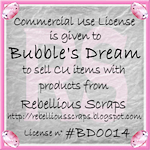 - You MAY NOT sell or offer element packs containing only my products. 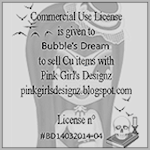 - You MAY NOT sell my original files or templates made from my products. - You MAY NOT sell my original files at all. 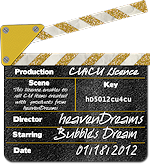 My scripts and templates are not to be taken apart and resold. a flattened single layer colored image. in the items in which my designs are used. 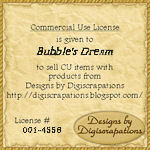 or offering the CU items that you create with my CU items. or for any reason !! !